Most people today know the benefits of including omega-3 fatty acids (alpha-linolenic acid) in their diets. The essential fatty acid found abundantly in fatty fish such as salmon, mackerel and sardines has been praised as a miracle nutrient that should be consumed by people every day. Why? Because it works to help combat heart disease, stroke, arthritis and inflammation. It also helps with brain function so it makes you smarter, and aids in bone production. But did you know that omega-3 is also good for your dog? I'm not sure what it does internally to a dog, but I do know what it does to a dog externally to its skin and coat. This past winter my Shiloh Shepherd, Shadow, had the worst case of doggie dandruff I had ever seen in my life. Dry skin on my kids, me and the dogs is a side effect of furnace heat during the cold winter months. 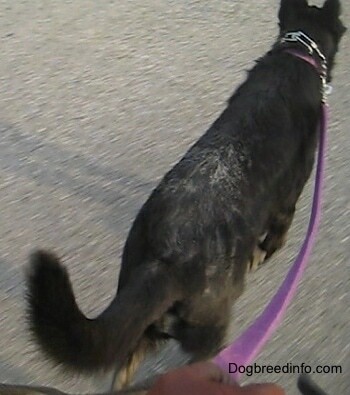 But Shadow's was so bad it looked like someone had sprinkled talcum powder all over her back. 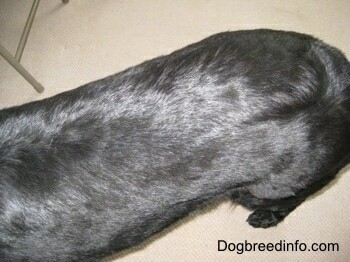 The fact that she has a black coat only served to exaggerate the appearance of the problem. I was actually too embarrassed to take her out in public fearing people would be disturbed by her massive flakes. I would brush her with no improvement and even took her for medicated baths at the groomers but nothing helped. Finally, I got the idea to ask my pet store owner if she knew of anything that would help with this problem. She knew! She suggested a supplement to be added to my dog's food. It was omega-3 fish oil from salmon. The brand she happened to carry is shown below. I bought the fish oil and began that evening to add it to her dinner. It came in a bottle with a pump and said to add about eight pumps to her meal. The oil smelled just like fish, like you'd expect, and my dog loved it. She woofed her food down and came back to beg for more. Of course she always does that anyway, but it's good to know she likes the fish oil too. I continued to add the supplement to her food every night and by the end of the first week, her dandruff was completely gone! But, I also noticed an added benefit besides the healthier skin. Her coat had become much shinier, softer and thicker! She looked so good I started to give the fish oil to my other two dogs as well even though they didn't have any dandruff. Their coats have also become shinier and/or softer and thicker. If your dog has skin issues, try treating her/him from the inside with fish oil supplements (for dogs) instead of trying to cure it from the outside with shampoos and conditioners. Chances are you'll have as much success as I did.